HP Indonesia and Sentra Grafika Kompumedia, Participating at Solidworks 2017 Innovation Day in Jakarta, Showing The Latest Jaw Dropping HP Z Workstation Solution on Mobile. 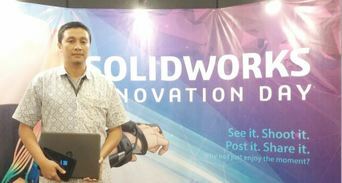 October 2016 - Sentra Grafika Kompumedia and HP Indonesia were excited to show the HP Z Workstation latest solution at Solidworks 2017 Innovation Day in Jakarta, on October 18, 2016. 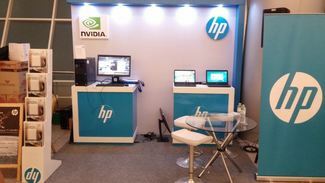 On the booth, we're showing the latest HP Z840 using Intel latest v4 Xeon processors, along with HP Zbook 15 G3 Mobile Workstation, as well as HP's first in the world quad-core Ultrabook Workstation: the HP Zbook Studio G3. During live on stage presentation session, Bimo Adi Prakoso, the Director and Founder of Sentra Grafika Kompumedia was delivering a ground breaking HP Remote Graphics Software presentation using HP Pro Tablet 408, connected through broadband network to the HP Zbook 14. This presentation might be the first of its kind in relying on HP RGS on broadband network from the beginning to the end of his presentation in Indonesia. There were dozens of tips and knowledge shared on his presentation about the performance, reliability, innovation and solution, based on HP Z Desktop and Mobile Workstation. It was also shown that he was having fun with his aeromodelling hobby, creating all of his parkjet designs using HP Zbook 14 and Zbook Studio. Two of them were the legendary Sukhoi SU-37 Flanker-F and Northrop YF-23 Black Widow II. There were crowds on our stage until we were not able to take more pictures to show as visitors were fascinated! May be later on, the event organizer would be keen enough to share what they shot on us. Once we get it, we will upload it here. Complete your life with smarter work sessions and harder play time, with HP Z Workstation! Pixar RenderMan, Is Now Available for Blender. February 2016 - RenderMan has been Pixar's core rendering technology for over 25 years, and has been developed to meet the ever-increasing challenges of 3D animation and visual effects. Today, RenderMan is having fully integrated bridge with Blender, the free and open source 3D creation suite. For further information, you could visit Pixar RenderMan site, HERE. Trisakti University Jakarta, Continue Their Trust on HP Workstation for Oil and Gas Lab Computing Power Needs. January 2016 - Fakultas Teknologi Kebumian dan Energi (FTKE), Universitas Trisakti, Jakarta, once again continuing their trust to carefully select HP Workstation to complete their Lab's High Performance Computing requirements. HP Z440 was chosen and many units are now populating the FTKE Lab. There are previous HP Z820 and HP Z420 units already and the new HP Z440 deployment in FTKE strengthens HP Workstation acknowledgements in the education sector.